Inspired by the natural geometry of Radiolaria, intricate mineral skeletons, the central light of this lamp design is diffused through complex and clustered ceramic ‘seeds’. These delicate and detailed forms are individually made and hand carved by Cristina Vezzini in the London studio, their shapes, textures and patterns reminiscent of microscopic organisms. 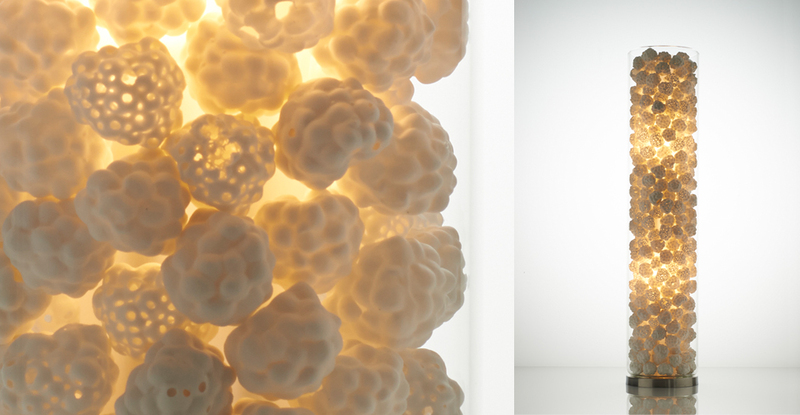 These ‘seeds’ are encased within a glass tube, hand blown by Stan Chen, giving the lamp its final scale and form while drawing attention to the individual shapes and textures of the ceramic pieces. The eye is drawn from the macro to the micro, playfully referencing the connection between the visible and invisible in the natural world. 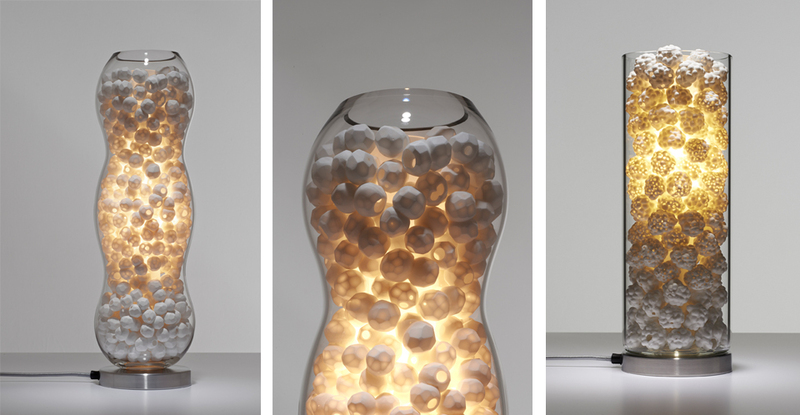 Three variations of the Radiolaria are available as a table light. The three glass shapes each house a different form and texture of ceramic ‘seed’; the same central concept giving an entirely unique outcome with each design. Cloud, the linear form is also available as a dramatic floor lamp at double the height of the table lamp.